So, I was really worked up the other day. The dogs were nervous in the crowds and someone decides to get into an argument right beside us. Seriously!? Was that the time? This tiny woman couldn't have been more than 5'2" yet she decided to get into an argument with someone twice her size by accusing him of "lying" about having nothing after Sandy. Really? After such a tragedy, I know there may be people trying to take advantage of others' kind hearts, but isn't it better to give them the benefit of the doubt? What if he actually had lost everything? What was the point in arguing? Anyways, it was just silly and they were intensifying and in effect, scaring my babies. I couldn't move, of course, because I was waiting for someone and the crowds had swarmed in on the action. I couldn't risk my babies getting hurt. At that point, the SO decided to take a picture of me. Um, ya, I was pissed. This is going to get ugly. Just kidding! Well, the story is true but I was more worried about the babies, not really angry. 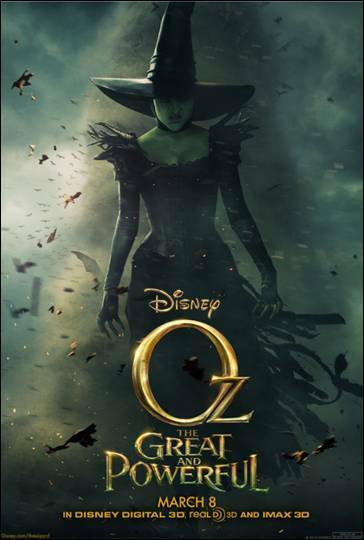 This is actually a new character poster for Oz, The Great and Powerful. Can you tell who it is? Scary, huh? Makes you wonder what made her so mad...LOL, I guess we'll have to wait until March 8th, 2013 to see! Or anger me and you'll see right away! Sad when people feel the need to argue...:( Got to wonder! The Disney Movie looks fantastic! I will be checking it out. I am really looking forward to this one! I want to be great and powerful! I always wonder about people who have to make themselves better by arguing about things they know little to nothing about... but i am looking forward to seeing how the Wicked Witch of the West is portrayed in OZ! HA! I love the story to work into the photo! So entertaining! But seriously...that was not the time nor place for an argument like that. It's a great poster, and I'm super excited to see the movie! My husband is excited to see the movie! Great way to draw readers in. I can't wait to see that movie either.